Reading and share top 3 famous quotes and sayings about Independence And Self Reliance by famous authors and people. Browse top 3 famous quotes and sayings about Independence And Self Reliance by most favorite authors. 1. 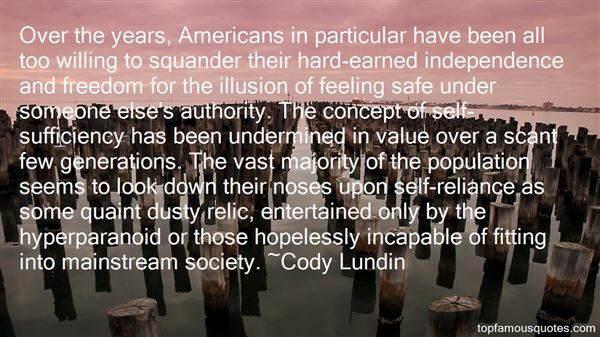 "Over the years, Americans in particular have been all too willing to squander their hard-earned independence and freedom for the illusion of feeling safe under someone else's authority. The concept of self-sufficiency has been undermined in value over a scant few generations. The vast majority of the population seems to look down their noses upon self-reliance as some quaint dusty relic, entertained only by the hyperparanoid or those hopelessly incapable of fitting into mainstream society." 2. 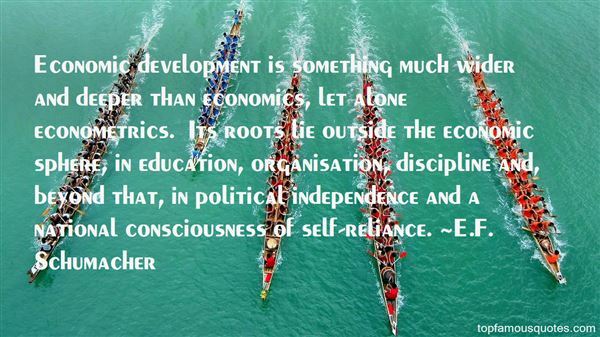 "Economic development is something much wider and deeper than economics, let alone econometrics. Its roots lie outside the economic sphere, in education, organisation, discipline and, beyond that, in political independence and a national consciousness of self-reliance." 3. "There is one aspect of the change in moral values brought about by the advance of collectivism which at the present time provides special food for thought. It is that the virtues which are held less and less in esteem and which consequently become rarer and precisely those on which the British people justly prided themselves and in which they were generally agreed to excel. The virtues possessed by Anglo-Saxons in a higher degree than most other people, excepting only a few of the smaller nations, like the Swiss and the Dutch, were independence and self-reliance, individual initiative and local responsbility, the successful reliance on voluntary activity, noninterference with one's neighbor and tolerance of the different and queer, respect for custom and tradition, and a healthy suspicion of power and authority." Love gives without expectation, while hate carries an endless tally of debts."